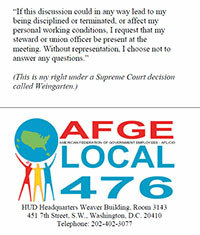 If you think a conversation with management may lead to disciplinary action, ask for a Local 476 steward or officer. It's your "Weingarten right." You can ask at any time in the discussion that your Union representative be present. Your Union is here to support you. But YOU have to ask. Management does not have to tell you about this right. This is one of your "Weingarten Rights," named for a Supreme Court decision, NLRB v. J. Weingarten, Inc. (1975). It applies to investigative interviews where you are asked to answer questions that you think may lead to a disciplinary action. You do not have the be the subject of an investigation. The Weingarten case was based on a lawsuit that resulted from a lunch counter employee, Laura Collins, being accused of stealing. Her employer claimed that she had taken a large box of chicken but had paid for only a small box. Collins had actually taken only four pieces of chicken--the amount that goes in a small box--but put them in a large box because there were no more small boxes. Collins was cleared of any charges of wrongdoing. During her interview with the manager and a loss prevention specialist, Collins had asked several times for her union rep or shop steward. Her management would not permit this. Management asked her not to tell anyone about the interview, but Collins told her shop steward about it and the union filed an unfair labor practice charge against the company. When the matter reached the Supreme Court, the Court decided that an employee is entitled to union representation for investigatory interviews. Click for a printable Weingarten card. If you are asked to answer questions, and you think that the discussion could lead to discipline, you should ask for a Union representative or officer. You do not have to put your request in writing. Keep our handy Weingarten card in your wallet so you remember what to say! Ask for a Union representative at any time before or after the meeting begins. Stop answering questions once you have asked for a Union representative, until your representative is present. Rely on your own judgment about the possibility of discipline. Rely on assurances from officials who have the authority to assure you that there is no possibility that the discussion will lead to discipline. Not be coerced or intimidated into giving up your right to representation. Not be punished for requesting a representative. Demand representation at a routine meeting, including a performance review or counseling session, or for a one-way announcement, such as receipt of a warning or a decision. Unreasonably delay the interview to wait for a particular representative. Demand representation by anyone other than a duly appointed Union steward, including a personal lawyer. Refuse to answer questions once your representative is present, or if you have not asked for a representative. Have the representative speak for you. Grant the request and delay questioning until the representative is present, end the interview immediately, or offer you the choice of proceeding without representation. Inform the Union representative about the subject of the interview, including the type of misconduct under discussion. Allow you to speak privately with the Union representative before beginning questioning. Consult with you privately before the interview. Attend the interview with you. Ask questions, and ask for clarification of questions during the interview. Advise you on how to answer questions and object to improper questioning. Help in providing relevant information. Ensure you are not harassed or intimidated. Record or tape an interview without management's permission. Bargain over the nature or purpose of the interview.